Thank you to all those who attended the 5th national Melanoma Summit which was held at the Cordis Hotel Auckland on 2 – 3 November 2018. Hosted by MelNet with support from the Health Promotion Agency (HPA), the two-day multidisciplinary meeting attracted 215 national and international delegates. It also marked the 10-year anniversary of MelNet. identifying priorities for action for New Zealand. This year’s programme involved a wide range of professionals across all areas of melanoma management. Presentations from consenting authors can be provided on request to the MelNet Coordinator. Lobby for a ban of commercial sunbed providers. 3. Develop a closer relationship with our Australian colleagues, particularly around the coordination of conferences. This was also agreed at the MelNet AGM which was held as part of the Summit. Media coverage of the Summit included radio, print and television interviews with overseas. Links to these articles and interviews can be found in the media section of the MelNet website. The MelNet Executive Committee and the Health Promotion Agency, as hosts of the 2018 New Zealand Melanoma Summit would like to thank all the speakers, including chairs, panellists and presenters of the breakout sessions who were very generous in donating their time and expertise. We would also like to thank our sponsorship partners. 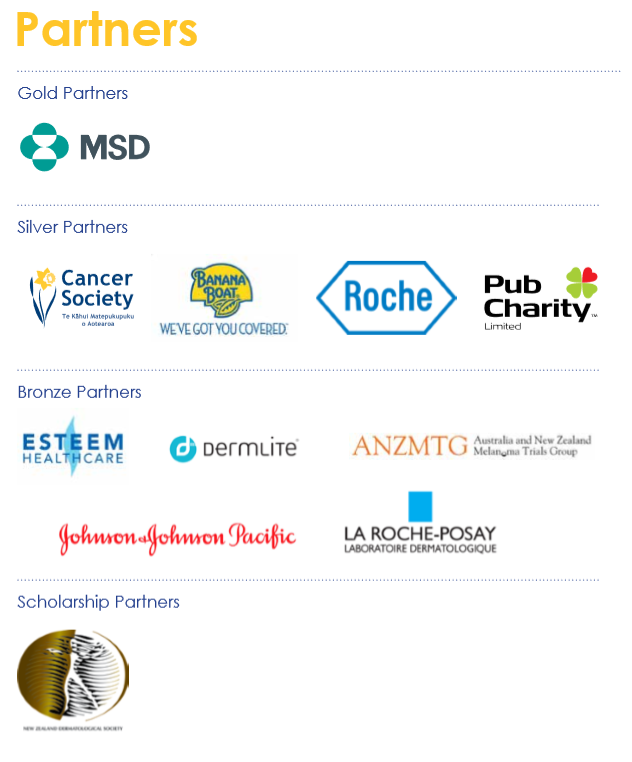 These include our gold partner MSD NZ, our silver partners the Cancer Society, Banana Boat, Roche Products New Zealand and Pub Charity; and our bronze partners Esteem Healthcare, La Roche-Posay, ANZMTG and Johnson & Johnson, as well as our trade display sponsors Heine, Skin Cancer College Australasia, Bernier Pharmaceuticals, Skin Cancer Symposiums and New Zealand Skin Cancer Doctors. Their support not only made this event possible but also helped to keep the registration fee reasonable to ensure wide attendance. We look forward to growing these relationships further in the coming years. The MelNet Executive Committee acknowledges and thanks the Health Promotion Agency and its staff for the immense contribution they made to planning and running of this event. Without their ongoing support, MelNet as an organisation and its ability to co-host these Summits would not be possible. We look forward to seeing you at the next Summit in 2020.